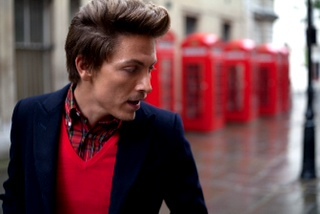 Picture caption "The Voice runner-up Tyler James is one of the acts performing at this year's Leeds Lights switch-on"
Successful Britain's Got Talent and The Voice contestants the Loveable Rogues and Tyler James have been announced as the main musical performers at this year’s Leeds Lights Switch-On. The annual party takes place at Victoria Gardens from 6:45pm on Thursday 8 November as Leeds begins the run-up to the Christmas celebrations. Loveable Rogues are Eddie, Sonny and Té - three talented boys who recently shot to fame with their "original, fun and organic" songs on Britain's Got Talent 2012. Since winning their fourth place spot on the show, the trio have hit the music scene in a big way - pulling in over 200,000 followers on Twitter and signing to Simon Cowell's Syco Music. Tyler James is a British singer-songwriter from Canning Town, East London. Tyler rose to fame in 2004 when his debut single, "Why Do I Do? ", made an appearance on the UK Singles Chart—peaking at number twenty-five. His debut studio album, The Unlikely Lad, was released through Island Records on August 29, 2005. The singer-songwriter returned to prominence in 2012, when he appeared as a contestant on the first series of The Voice UK—finishing as the series' runner-up behind Leanne Mitchell. Organised by Leeds City Council and Real Radio with support from the Yorkshire Evening Post, the annual family event which attracts approximately 15,000 people is seen as the official start of the countdown to Christmas and shopping season in Leeds, with the finale of the show seeing the switch flicked to turn on one of the largest festive illuminations in the UK – covering over 15 miles around the city centre. The show, hosted by Real Radio breakfast presenters Dixie and Gayle, will be marked by a fantastic firework finale and joining Loveable Rogues and Tyler James on stage will be a variety of other special guest celebrities, local sporting heroes, pantomime characters and of course Santa! Full details of the line-up will be revealed over the coming weeks. “I can’t wait to get back on stage with Gayle to light up Leeds! It’s always a massive party. We have some great guests lined up this year and we are really excited to see the Loveable Rogues and Tyler James both perform live on stage”. For more information on the event go to www.leeds.gov.uk/switchon or call the council’s events team on 0113 395 0891.